Thomas Dunne Books, 9781250038944, 288pp. An immensely talented writer whose work has been described as "incandescent" (Kirkus) and "poetic" (Booklist), Thomas Christopher Greene pens a haunting and deeply affecting portrait of one couple at their best and worst. Inspired by a personal loss, Greene explores the way that tragedy and time assail one man's memories of his life and loves. Like his father before him, Arthur Winthrop is the Headmaster of Vermont's elite Lancaster School. It is the place he feels has given him his life, but is also the site of his undoing as events spiral out of his control. Found wandering naked in Central Park, he begins to tell his story to the police, but his memories collide into one another, and the true nature of things, a narrative of love, of marriage, of family and of a tragedy Arthur does not know how to address emerges. Luminous and atmospheric, bringing to life the tight-knit enclave of a quintessential New England boarding school, the novel is part mystery, part love story and an exploration of the ties of place and family. 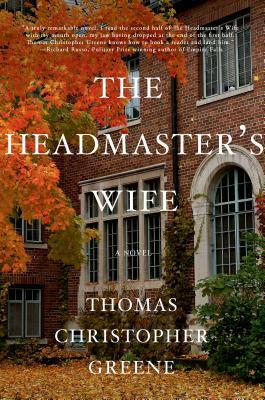 Beautifully written and compulsively readable, The Headmaster's Wife stands as a moving elegy to the power of love as an antidote to grief. “While the story is totally different, there is a likeness to A Beautiful Mind that teases at your senses… The twists are amazing and the ending is unexpected. If you enjoy novels that make you think and those that take you into the unimaginable, you will find this to be a terrific find. There is mystery and romance, as well as friendships and hidden agendas.